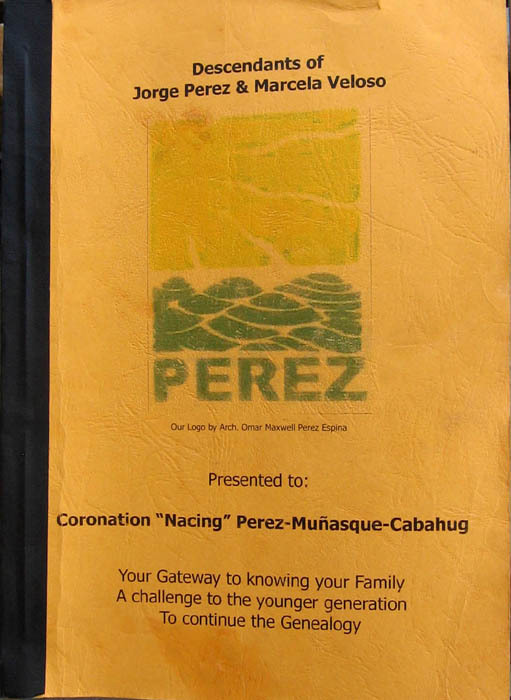 The genealogy and history of the Perez family of Mandaue is contained in the 297 page book entitled Descendants of Jorge Perez and Marcela Veloso1 compiled by family members under the direction of Coronacion "'nang Nacing" Cabahug and produced by the Perez Clan of Mandaue, December 29, 2005. Information for the book, hereafter referred to as the Perez book, was collected in the late 1980's and throughout the 1990's, with publication in 2005. Unfortunately, during preparation of the book information on our branch of the family (Sergio Branch) was lost. The source of most of the information on the earliest family members is Conrado "Inkoy Olon" Perez, who was interviewed in the 1980's. Through his memory, we have the names of his great-grandparents Jorge Perez and Marcela Veloso and members of their family. Due to a lack of records and the fact that people did not have surnames prior to 1850, it is not possible to trace earlier family members. The Perez book presents several stories on the origin of the family, including the tale of a Chinese trader who married a local girl with whom he had three sons. As the story goes, when the sons chose their surnames in 1850, they selected the names Perez, Espina and Ceniza, thus founding these three related families. Such a choice is highly unlikely, since the selection of surnames was carefully regulated by the local priest. (See Claveria's decree for details.) Further, most Chinese were expelled from the Philippines in the late 1700's. However, it is likely this story reflects family memories of their past, indicating that the family originated in the Chinese-mestizo community and that they are closely related to the Espina and Ceniza families. Dr. Michael Cullinane4 of the Center for Southeast Asia Studies, University of Wisconsin-Madison has uncovered evidence indicating that the Perez family was part of this Chinese-mestizo community which originated in old Parian and later spread northward into Mabolo and Banilad. Although a direct connection to Jorge Perez has yet to be established, it is likely that our Perez ancestors came from this community. That Jorge married Marcela Veloso supports this theory, since the Velosos were a prominent Chinese-mestizo family. The recollections of Conrado Perez and other elderly family members yielded the children of Jorge Perez and Marcela Veloso listed below. Detailed information for the families of their children is presented in the Perez book, with the exception of Sergio Perez. These pages attempt to partially remedy this defieciency. i. Eulogio Perez Eulogio married Felipa Cortes. ii. Cristina Perez Cristina entered the Convent and became a Sister of Charity. iii. Francisco Romano Perez Francisco married Joaquina Seno . v. Esteban Perez Esteban married Lorenza Sanchez . vi. Hilario Perez Hilario married Marcela Mañago. vii. Filomena Perez Filomena entered the Convent and became a Sister of Charity. i. Ignacio Perez Ignacio married Anastacia Zanoria . Ignacio Perez lived in Mandaue, Cebu, Philippines during the 1800's. Unfortunately, we have no information on when he was born or when he died. The Perez book1 states that Ignacio married Anastacia Zanoria. This is partly confirmed by his granddaughter, Catalina Perez ('Na Taling), who knew her mother's middle name to be Zanoria7. Ignacio was remembered with pride by, 'Na Taling who typically referred to him as Don Ignacio. She knew of Don Ignacio Perez as a prominent citizen of Mandaue, able to afford an advanced education for his son, Perfecto. Dr. Michael Cullinane4 has found "a reference in the Cebu newspaper (El Pueblo) of 9/14/1901 that the house of the prominent resident of Mandaue, Ignacio Perez, had just been burned down by the American forces operating in that municipality. There is no mention of him in the article, but the assumption in such accounts was that his house was burned because he was sympathizing or supporting the resistance." Apparently Don Ignacio and/or his family were active in supporting the cause of Philippine independence and resisted the American takeover after the Spanish-American War. The further expansion of our Perez family tree was aided by the recollections of 'Na Taling, who provided a list of his children and some of his grandchildren7. She listed the following children of Ignacio and Anastacia. It is not clear that they are listed in the order of their birth. i. Perfecto Perez Perfecto married Lorenza Neiz. ii. Gregoria Perez Gregoria married Lorenzo Cortes. iii. Venancio Perez Venancio married Dominga Malazarte. iv. Maria Perez Maria was unmarried. v. Maximo Perez Maximo married Basilia Nolasco. vi. Bonifacia Perez Bonifacia married Norberto Rosal. Maria Perez remained single throughout her life. She died on June 12, 19453, 11 . The Civil Register lists her age as 107. If this is correct, Maria was born about 1838, which makes it likely that Maria was the oldest child in the family.